Hello everyone. This post is a little late, I have had a bunch of uni assessments due all at once so it took over my life for a short period of time. I am trying to organise my time better so I can craft and blog more often, those assessment just sneak up on you sometimes though, not to mention the many adventures that life throws your way, especially with 2 kiddies at home. You can use a variety of different materials to make this box and change the design however you like, just think about what coordinating colours you want to use and either hit your local craft store, jump on ebay or search through your stash. My partner accompanied me to the craft shop to buy the items for this project and he actually picked out the bling sticker and paper flowers, he has a good eye that's for sure, I love the way they all look together. 1. 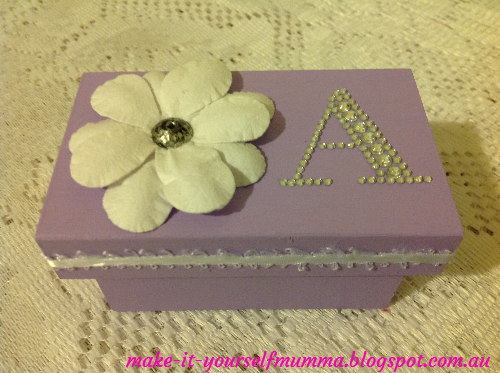 Paint the box with acrylic paint in your choice of colour. You will need to use 2 coats all over and make sure the paint dries between each coat. TIP: Use a plastic covering to put over the surface you are working on, if you put your painted items down to dry on newspaper they will stick and be difficult to remove. If this does happen try using sandpaper to remove the bits stuck in the dried paint, you may need to repaint that side or area. 2. 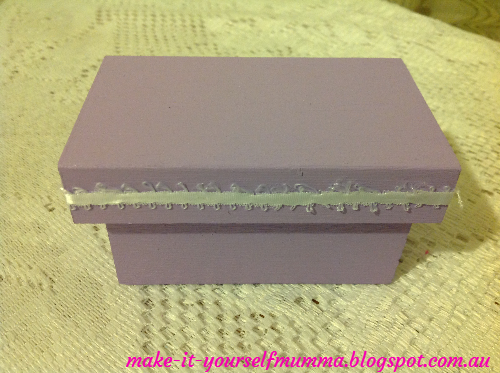 When completely dry, glue some ribbon around the rim of the lid. Use glue sparingly and spread it lightly across the ribbon with a paddle pop stick, spare paint brush or your finger to prevent the glue from seeping out once you stick it on and smooth it down. Put aside to let the glue set. 3. Arrange the decorative items on the top of the lid to get an idea of where you want them all to sit. 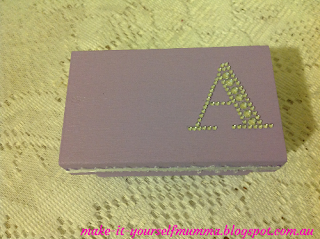 Next, peel the backing off the bling sticker and carefully stick it in place. Smooth down to ensure it is stuck on properly. 4. Place a small dab of craft glue in the centre of the back of the paper flower. 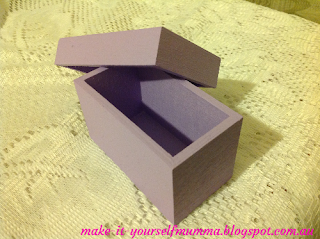 Wait about 30 seconds to a minute then place it on the lid of the box next to the letter. Put aside to let the glue set. This part is all done now. 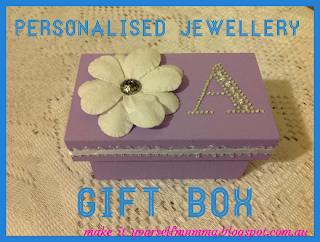 If you want you can use it to put a small gift in, but please remember to check in soon for my tutorial on the earring insert to go inside this box. It is super simple and quick. This post was featured HERE. As the owner of the content and photos on my blog, I ask that you leave all of my work here. I am more than happy for you to link back to my blog if you enjoy my projects but any duplication of the materials here without my permission is strictly prohibited. Please email me if you have any questions. Check out all these parties I link up to!